Abby is home sick enough that I needed to take her to the doctor at midday. At the exact time I was attempting to do so, everyone in Ada apparently decided to head home simultaneously due to heavy snowfall. Normally the drive to the doctor takes less than 15 minutes, but between the traffic and power outages causing traffic signals to default to flashing red, it took us an hour. Fortunately, we planned for exactly that, and Abby saw the doctor and got a big bottle of giant red capsules. We went in Abby’s 4×4 Nissan Frontier, and, as I have said before, it owns the snow. The collective IQs of area drivers dive into single digits when under stress; Abby and I got a big kick out of listening to all the scanner calls, and we saw several people make several glaring snow-driving mistakes. Kids no longer walk to school, so parents “have to pick them up” in their cars. I walked to and from school until I could drive, and even then I walked some of the time. Our newspaper planned for the contingency, and moved deadlines up for Sunday’s paper to nine tonight so we can get it delivered tomorrow despite the weather. I was only slated to work one game tonight, and it was canceled, so here I am at home. I made Abby some chicken soup, and I am looking very desiringly at the bed in my dressing room. 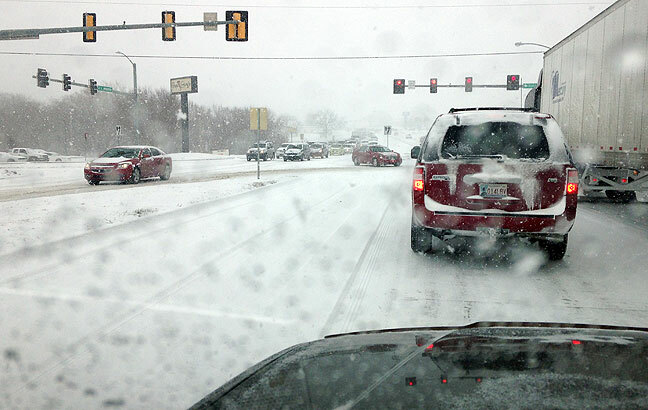 Traffic creeps along on Ada city streets during lunch hour today. I started really noticing this when I lived in Seminole, and it really bugged me. Every day people using the excuse “I’m late for work because I had to wait in the line of cars at the school to drop off my kids.” These are, I’m sure, the same people who will wait in a 20-car line at the McDonald’s drive-thru when they can see through the window that no one is in line at the counter. In my neighborhood, people drive their cars to check the mail, which is less than a block away, and drive their kids to the bus stop, which is right next to the mail box unit. And yes, quite a few drive their kids right past the bus stop and all the way to school. Every day. When I was in school, I always rode the bus; we lived much too far to walk (5.0 miles in high school and 5.6 miles in middle school, according to Bing). Yeah, somebody gave me a, “You drove? !” the other day.